Nokia enliven again the QWERTY phone market. It is characterized by two QWERTY phones Nokia is ready to circulate. 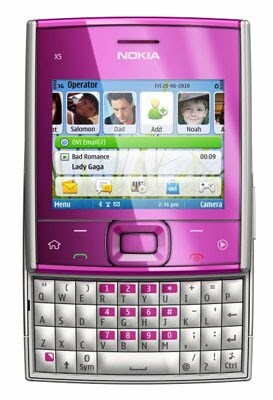 The second product is the Nokia E5 and Nokia X5. X5 will be circulate in August, followed later Nokia E5 in September. Unfortunately, the Nokia Product Manager, Legi Soegianto still reluctant to divulge the price range of new products. "Obviously we will deliver complete products in all segments," he said. Legi said QWERTY phones demand by consumers who enjoy typing long SMS via phone and email. Consumers of this type usually come from businesspeople and professionals. Character is different consumers with consumer touch screen mobile phone that focuses on ease of entertainment applications. "If the QWERTY phone demand by consumers who want convenience in their work, while the touch screen is favored by consumer entertainment enthusiasts," said Legi. This QWERTY lover was usually divided again based on the model aka candy bars and a slide bar. Businesses who want simplicity in operation often targeting mobile phones QWERTY candy bar. While customers liked the unique design with a slim weight prefer slide model. With this new product launch, Nokia hope this year can maintain the number one position in the mobile industry. "We became a leader in the mobile market globally and locally and we hope this year is stable in that position," added Staff of Nokia Communications Specialist, Jodie Otania.